"McDonald's menu" redirects here. For the McDonald's item outside the United States, see International availability of McDonald's products. McDonald's is one of the world's largest fast food chains, founded in 1940 in San Bernardino, USA and incorporated in Des Plaines, Illinois in 1955. Since then, McDonald's has become a household name in American households, known for selling a variety of convenience food items at thousands of locations worldwide. Throughout its history, McDonald's has experimented with a number of different offerings on the menu. In 2007, McDonald's had only 85 items on its menu. In 2013, McDonald's grew to 145 items on its menu. McDonald's beef patties are seasoned with salt and ground pepper. This list is based on core menu items in the United States, with some additions from global products. Hamburger (formerly known as the Junior Burger in some countries) and cheeseburger consists of a 1.6-ounce (45 g) ground beef patty, with 0.125 ounces (3.5 g) ketchup, mustard, dill pickle slices and re-hydrated onions on a toasted bun. In most of the New York City area, it is served without mustard. It is also sold as a double or triple burger. A triple burger and a bacon double cheeseburger are optional items and are not available in all restaurants or markets. In Australia, the average serving size for a cheeseburger is 110 g (3.9 oz). The hamburger and cheeseburger are the company's original grilled burger offerings, having been served as part of the 1948 menu. Big Mac – a signature product that was introduced in 1967. A Big Mac consists of two 1.6-ounce (45 g) (approx. uncooked weight) ground beef patties, special Big Mac sauce, lettuce, cheese, pickles, and diced onions in a sesame seed bun, with an additional middle bun (called a "club layer") separating the beef patties. The Grand Mac, its bigger-sized counterpart, was added in January 2017. And January 2019 saw the Bacon Big Mac debut. Quarter Pounder – a 4.25-ounce (120 g) (originally 4-ounce (113 g) until 2015) (approx. uncooked weight) ground beef patty with ketchup, mustard, chopped onions, pickle, and two slices of cheese. As with burgers made with the smaller 1.6-ounce (45 g) patties, the Quarter Pounder is prepared without mustard in all or a large portion of the New York City region. It was invented by Al Bernardin, a franchise owner and former McDonald's vice president of product development, at his McDonald's in Fremont, California, in 1971. In some markets unfamiliar with the United States customary units (such as France), it is known as a Royal Cheese, or variants thereof, such as McRoyale. It is also available as the Double Quarter Pounder with Cheese, which includes another patty of the same proportions. In 2013, McDonald's expanded the sandwich into a line with three additional variants to make them smaller versions of the Angus Burgers. It was renamed the Taste-Crafted Burger in 2016 in West Coast markets and later expanded to other U.S. markets in January 2017. It is available in Canada as the Mighty Angus The latest addition is the Signature Sriracha, reinstated in July through September and again since January 2018, which was replaced by Sweet Barbecue Bacon in May, before becoming Bacon Smokehouse since July. Big N' Tasty/Big Tasty – the Big N' Tasty, introduced in 2001, was a 4-ounce (110 g) beef patty with ketchup, cheese, mayonnaise with grilled, diced onions, pickles, leaf lettuce, and tomatoes. It was devised to resemble Burger King's Whopper sandwich. It is also known as the Big Xtra in Slovenia and most of Canada; the McXtra in Quebec, Canada; the McFeast Deluxe in Australia; the Big Tasty (without the 'N') in Brazil, Bulgaria, France, Germany, Italy (without ketchup), Ireland, The Netherlands, Poland, Portugal, Russia, Sweden and the United Kingdom; the Quarter Pounder Deluxe in South Africa; and the McNifica (a play on Spanish magnifica, 'wonderful') in Mexico and Latin America. The Big Tasty configuration is somewhat different, consisting of a third-pound (150 g) beef patty, sesame seed bun, lettuce, tomatoes, onions, Emmental cheese, and Big Tasty sauce (which has a smoke flavor). The Big Tasty Bacon variant also contains strips of bacon. This variant was sold in the US until 2009; it is now sold internationally only. Double Cheeseburger – two 1.6-ounce (45 g) ground beef patties, with 0.125 ounces (3.5 g) ketchup, mustard (except in all or much of the New York City area), two slices of dill pickle, re-hydrated onions, and two pieces of cheese on a toasted bun. The double cheeseburger was offered as a promotional item in the 1950s and was added to the regular menu in 1965, though many McDonald's restaurants did not list it on their menu boards. An official variant is offered in the U.S. state of New Mexico, called the Green Chile Double Cheeseburger, topped with roasted green New Mexico chile peppers. McDouble – similar to a Double Cheeseburger but with just one slice of cheese. Reintroduced as a permanent dollar-menu item in December 2008 – had been a short-term product in 1997, advertised with "Eddie the Echo". The original McDouble did not have cheese and was garnished with lettuce and tomatoes rather than with pickles and onions in the 2008 version. Bacon McDouble – a sandwich that is similar to the McDouble but has two pieces of Applewood smoked bacon added to it. This sandwich was added to the U.S. "Dollar Menu & More" in November 2013. Daily Double – similar to the McDouble, however, the toppings are slightly different. The Daily Double is prepared with lettuce, sliced tomato, slivered onions, and mayonnaise. It also has only one slice of cheese, like the McDouble, rather than the two slices that are on the double cheeseburger. In 2011 and 2012, the item was test marketed in various regional locations. McFeast – a hamburger with lettuce, tomato, pickles, and mayonnaise, in most markets from April 1977. The name McFeast lives on though in Scandinavian countries, where a McFeast has been served since the mid-1980s in Sweden and was later introduced to the rest of the Nordic countries; the McFeast in Sweden contains a quarter pounder patty, lettuce, modified mayonnaise with lemon juice, onion and tomato. In the rest of the countries, the McFeast also contains ketchup, but not in Sweden. The same burger was sold under the name Mega Feast in New Zealand for several years during the 1990s but has since been discontinued. The McFeast Deluxe was sold in Australia until the late 1990s and contained: mustard, ketchup, large onions, McFeast Deluxe sauce, lettuce, a tomato slice, regular cheese and a quarter pounder patty served in a Quarter Pounder/McChicken Bun. It returned to the Australian menu in 2009 and in August 2011 using the same ingredients, however,it contained McChicken sauce in place of the original 'McFeast Deluxe' sauce. The McFeast has been sold in Germany and Austria since the 1990s under the name Hamburger Royal TS (T for "Tomate" (tomato); S for "Salat", the German word for lettuce). It contains a quarter-pounder patty, lettuce, tomatoes, onions, cheese and the McChicken mayo sauce. For special occasions, it is sold in Germany as a McFresh which also contains cucumber slices. Ranger Burger and Super Ranger. 1955 Burger – this burger inspired by 1955 (according to the official site) contains beef, bacon, lettuce, tomatoes, caramelized onions, ketchup and McDonald's smoky sauce (barbecue). Named after the year the fast-food chain was incorporated by Ray Kroc, the burger is popular in European markets, including Spain, Italy, and Germany. It was released in 2011 and re-released in 2013 in the UK. BBQ Ranch Burger – a very sweet hamburger containing one beef patty, cheddar cheese, BBQ Ranch sauce, and tortilla strips, added to the U.S. "Dollar Menu and More" in November 2013. McSpicy Burger – a very spicy chicken breast, lettuce, cheese and hot sauce-laced mayo, served as the McSpicy Shake Shake Meal, complete with fries. Bacon Clubhouse – a burger consisting of one quarter-pound patty, lettuce, tomato, and special sauce served on an artisan roll. This core item was added to the menu the week of March 12, 2014. Jalapeño Double – similar to the McDouble, except it contains two types of jalapeño peppers, pickled and crispy, plus a slice of white cheddar cheese between the two burger patties, and buttermilk ranch sauce. Added to the Dollar Menu in April 2014. Triple Cheeseburger – similar to the Double Cheeseburger, except it contains three burger patties, with a slice of American cheese between each patty, plus ketchup, mustard (except in all or much of the New York City area), onion, and dill pickle. This was added to the Dollar Menu in December 2014. ChiTown Classic – a regional offering that was one of two finalists out of hundreds of entries in the "Chicagoland Burger Build Off" competition to develop a breakfast-dinner mashup burger in 2015. The burger was placed on the menu in Chicago area locations starting mid-November until December 27, 2015. The burger adds breakfast's Canadian bacon and applewood smoked bacon. McChicken – A mildly spicy chicken sandwich which is also offered in a spicier variant (the Hot n' Spicy) in some markets. The sandwich is made from 100% ground white meat chicken, mayonnaise, and shredded lettuce, on a toasted bun. A full-size version was introduced in 1980, later removed, and reintroduced in 1988. In some markets, it is not spicy, and in others, a cajun spiced version is also offered. It remains one of the biggest sellers, just behind the Big Mac. [original research?] The larger sandwich was replaced with the Crispy Chicken Deluxe in 1996, and brought back in 1998 in the current smaller size, and marketed as the Cajun (Style) McChicken. In Australia, the average serving size for a McChicken is 185 g (6.5 oz). In Canada, it remains a full-size sandwich, while the US' smaller version is sold there as the Junior Chicken. Premium chicken sandwiches – The Premium chicken line was added in July 2005. The Classic was a rebranding of the Crispy Chicken and Chicken McGrill sandwiches, themselves 1998 rebrandings of the Deluxe chicken line. It contains mayonnaise, leaf lettuce, and a tomato slice. The Ranch BLT contains ranch sauce instead of mayonnaise and includes bacon. The Club is similar to the Classic, with added bacon and a piece of Swiss cheese. In Latin America, the Classic and the Club are sold, but a honey mustard chicken sandwich is sold in place of the BLT. All were served on a whole-grain roll, with either a grilled or crispy chicken breast. On March 20, 2014, the Premium Crispy Chicken Bacon Clubhouse and Premium Grilled Chicken Bacon Clubhouse were added to the line-up (alongside the beef variant of the sandwich) on a new artisan roll. In February 2015 the Ranch BLT and Club were removed from the menu. The standard crispy offering was renamed the Premium Crispy Chicken Deluxe (later the Buttermilk Crispy Chicken Sandwich in August 2015) and it was upgraded to sit on the artisan roll introduced with the Bacon Clubhouse. In the first week of April 2015, McDonald's replaced the Premium Grilled Chicken sandwich with the Artisan Grilled Chicken. Taste-Crafted Chicken sandwiches - Like the Taste-Crafted Burgers, these sandwiches were introduced in 2016 in West Coast markets, and in all other U.S. markets in January 2017. Signature Sriracha was the latest to be added in June 2016, reinstated in July through September 2017, and reinstated again permanently in January 2018; it was replaced by Sweet Barbecue Bacon in May 2017, which by July 2018 was changed to Bacon Smokehouse. Southern Style Chicken Sandwich – A southern-style fried chicken breast filet is served on a steamed bun, dressed with butter and two pickles. Nearly identical to a Chick-fil-A chicken sandwich. Discontinued at many franchises in early 2015. Snack Wrap – a wrap made with white meat chicken breast (crispy or grilled), lettuce, shredded Cheddar cheese and Monterey Jack cheese, and a sauce (Spicy Buffalo, Ranch, Honey mustard, Chipotle barbecue, or Salsa Roja, the breakfast sauce on the McSkillet), wrapped in a soft flour tortilla. It was launched on July 1, 2006. Chipotle BBQ is the most recent flavor. Available in the United States, The Netherlands, United Kingdom, Canada, Australia, and Brazil. [not in citation given] There is also a Mac Snack Wrap which features the fixings of the Big Mac but without the bun. It is wrapped in a tortilla shell, and uses one half of a piece of quarter meat. Premium Chicken McWrap – in 2013, McDonald's in the U.S. introduced a larger wrap that it has had success with in parts of Europe. It comes in three variants: Sweet Chilli Chicken, Chicken & Bacon, and Chicken & Ranch. Chicken Fajita – chicken, cheese, red and green bell peppers, and diced onions in a flour tortilla. Comes with Picante sauce packets on request, which are available in mild and spicy. Available in only a few markets. Chicken McNuggets – introduced in 1983 as a replacement for the McChicken, these are small chicken chunks served with dipping sauces of barbecue, sweet n' sour, honey, and hot mustard. McNuggets are available in 4, 6, 10 (originally 9), or 20 pieces. Occasionally, they are made available in 40- or 50-piece packs on a promotional basis. While made from a combination of white and dark meat until 2003, they are now made only with white meat. In 2011, five new dipping sauces were introduced and added to the line-up: sweet chili, honey mustard, spicy buffalo, and creamy ranch. With the addition of these new dipping sauces, McDonald's began phasing out the Hot Mustard sauce, and by February 2014, it had been discontinued in most U.S. markets, while in Quebec, Canada, at least, the original four dipping sauces (barbecue, sweet 'n sour, hot mustard and honey) persist as of 2018. McArabia – there are two versions of the McArabia: grilled chicken, and grilled kofta (beef with spices). Both are served with lettuce, tomatoes, onions, and garlic mayonnaise in addition to two small patties of grilled chicken or kofta, all wrapped in an Arabian-style pita bread. McDonald's has employed a rather large advertising campaign for the McArabia since its introduction in 2003, largely focusing on the Arabian-themed nature of the sandwich, and it appears to have worked well. The McArabia has been very well received throughout Southwestern Eurasia. The same product is also introduced in Malaysia with "Chicken Foldover" as an alternative name. (Premium) Crispy Chicken Deluxe – a sandwich made with a crispy chicken breast, tomato slices, and lettuce. It was first sold in 1996 and had its name changed to the Crispy Chicken Sandwich in 1998. It was replaced with a Premium chicken sandwich in July 2005 and was then brought back in 2015 under the original name with the added prefix Premium. The only other change is that it is now sold on an artisan roll instead of the potato bun that characterized the original Crispy Chicken Deluxe. By August 2015 it was renamed the Buttermilk Crispy Chicken Sandwich. This is part of the Taste-Crafted Chicken sandwiches introduced in 2016. Grilled Chicken Deluxe – this sandwich has the same ingredients as the Premium Crispy Chicken Deluxe but has a marinated, grilled chicken breast at its center. It has been sold under various names since 1996, when it was introduced as the Grilled Chicken Deluxe, and had its name changed to the Chicken McGrill in 1998. It was replaced with a Premium chicken sandwich in July 2005, which was in turn replaced with the Artisan Grilled Chicken in 2015. It is also available in India and has at times been available in Canada. Artisan Grilled Chicken – in the first week of April 2015, McDonald's introduced a redesigned grilled chicken patty, replacing the Premium Grilled Chicken sandwich, which contains "fewer ingredients", and those that remain can be found in consumer's "own kitchens". The sandwich sits atop the artisan roll first seen with the Bacon Clubhouse and is the last of the full-size chicken sandwiches to switch to this bun. It is part of the Taste-Crafted Chicken sandwiches menu introduced in 2016. Maharaja Mac – In India, McDonald's does not serve beef in its burgers. Instead, it has created a large Big Mac style chicken burger called the "Chicken Maharaja Mac", with a chicken patty and vegetable garnishings. Chicken McBites – "Poppable" pieces of chicken that are made from chicken breasts. These were available in the US with trials starting in September 2011 and were discontinued in 2013. They remain available in some international markets, including Italy. Tasty Basket – Available only in Italy, the Tasty Basket consists of 30 pieces of chicken, which includes the Chicken McNugget, Chicken McBites, and chicken wings. Chicken Selects - Still available in the U.K., these are strips of chicken cooked from frozen and served in a 3 or 5 piece serving. They were discontinued in the United States and eventually replaced with Buttermilk Crispy Tenders. Buttermilk Crispy Tenders – These strips are formulated with the buttermilk recipe used for the August 2015 revamp of the fried chicken sandwich, and were introduced in U.S. restaurants in September 2017. While they bear a resemblance to Chicken Selects, they are created and prepared differently. They feature a buttermilk chicken base and are cooked from thawed instead of frozen. This creates a juicier product than the Selects as well as reduces cook time., though immediate supply issues caused them to effectively be removed from the menu until the end of December 2017. This was caused by demand being much higher than forecast. Filet-O-Fish – a fish fillet with tartar sauce and a half slice of cheese on a steamed bun. It was introduced in Cincinnati in 1962 when it was discovered that many Roman Catholics chose to eat at Frisch's Big Boy on Fridays and during Lent, as it offered a fish sandwich so customers could go without meat. This was replaced with the Fish Filet Deluxe in 1996 and brought back in 1998 albeit with a larger fish patty. During the Easter period in Hawaii and Guam, a Double Filet-O-Fish meal is offered with two pieces of fish on one bun. Fish McBites – similar to the Chicken McBites, these are small pieces of flaky whitefish dipped in batter and fried until golden brown, and served with tartar sauce for dipping. They were taken off the menu at the end of March 2013. McRib – a sandwich featuring boneless pork with barbecue sauce, slivered onions, and pickles. First seen in test-market stores near interstate highways around Milwaukee and Madison, Wisconsin in the late 1970s (along with early tests of personal-sized pizza), the McRib was more widely released in 1981 but pulled from the menu in 1985. It is released annually in the U.S. as a limited time promotion in some locations. Since 2005, the McRib has reappeared in late October staying on the menu for 10 weeks. The McRib was released in Canada as a promotional sandwich from March 18 through April 8, 2008, and again in summer 2011. The McRib is presently on some European menus (e.g., Germany, where it has been standard since or even before 1990). In Vietnam, grilled pork is sold, but with rice; egg is optional. McDonald's introduced salads to its menu in 1987. Since that time, they have restructured their salad lines several times. In the U.S., the newest salad offerings are part of the McDonald's Premium line. First introduced in 2003, the Premium Salads are a mixture of iceberg lettuce and a special lettuce assortment (romaine, etc. ), with cherry tomatoes and different toppings to differentiate them; additionally, all salads can be topped with warm grilled or crispy chicken. All of its salads are part of McDonald's move towards creating a healthier image. The Happy Meal/Mighty Kids Meal – McDonald's capitalized on Burger Chef's Funmeal concept of a children's meal when it introduced the first Happy Meal in 1979. The meal includes an entrée, a side dish, a beverage and a toy. Happy meals include a tiny order fries (around half of a small order of fries) and fruit, optional sauce for fries, and a choice of nuggets, a single patty burger, or wraps. An additional product, Pasta Zoo was discontinued in 2008. The Mighty Kids Meal contains more food than the Happy Meal, less than the adult meal, and still contains a toy. The toy is usually a product tie-in with a movie or popular television show. In mid-February 2012, McDonald's introduced the Happy Meals/Mighty Kids Meals so that they now come with either a Hamburger, Cheeseburger, 4-piece Chicken McNuggets, McDouble or the 6-piece Chicken McNuggets with a smaller version of the small fry for the Happy Meal or a small fry for a Mighty Kids Meal. All kids meals now come with fries, apple slices, and a toy. The apple slices have been reduced from 8 slices to only 4 and no longer come with caramel dipping sauce. In the U.S., the entrée is a choice of hamburger, cheeseburger, or a four-piece order of Chicken McNuggets (or a double cheeseburger or six-piece order of Chicken McNuggets for the Mighty Kids Meals); the sides are fries and sliced apples. Milk, chocolate milk, boxed apple juice, and soda are choices for drinks. Some U.S. franchises also include a small cellophane package of McDonaldland cookies. In 2009, McDonald's offered a Happy Meal Wrap, but it was discontinued later that year due to low sales. In the UK, the entrée is a choice of hamburger, cheeseburger, four Chicken McNuggets, three fish fingers, or a Chicken wrap; the sides are a choice of fries, carrot sticks or a fruit bag (sliced apples and grapes (February - May) (September - November), melon (June - August) or a pineapple stick (December - January). Organic milk, Tropicana orange juice, apple and blackcurrant Robinsons Fruit Shoot, milkshakes, water and soda are the choices for drinks. In New Zealand and Australia, the entrée is a choice of hamburger, cheeseburger, three or six-piece order of Chicken McNuggets, five or ten Chicken McBites or a crispy or seared Chicken Snack Wrap; the sides are a choice of french fries or apple slices. Thickshake, boxed chocolate milk, apple or water pop tops, orange juice, and soda are choices for drinks. In Canada, the entrée is a choice of hamburger, cheeseburger, four-piece Chicken McNuggets, grilled cheese, or chicken snack wraps; the sides are a choice of fries or apple slices with caramel dip. Milk, chocolate milk, boxed apple juice, orange juice, and soda are choices for drinks. In Belgium, the entrée is a choice of hamburger, cheeseburger, four-piece order of Chicken McNuggets, McFish or a Ketchup Wrap. McDonald's line of larger chicken sandwiches (The Classic, Club, Ranch BLT, and Southwest), which are part of the McDonald's Premium line were introduced in July 2005 as part of McDonald's menu revamp. The Classic includes lettuce, tomato, and mayo. The Club also has lettuce, tomato and mayo but also comes with Swiss cheese and bacon. The Ranch BLT comes with a creamy ranch sauce, bacon, lettuce and tomato. The Grand Chicken Burger: Large chicken patty with two layers of cheese, tomatoes, lettuce, and sauce. The Southwest comes with a southwest style nacho chili sauce, lettuce, tomato, and spicy pepper jack cheese. All four can be chosen with either crispy or grilled chicken and all are served on a wheat ciabatta bun. Deli Choices is a line of deli-style sandwiches that are sold internationally. It is targeted at health-conscious customers and is available in Australia, Austria, Canada, Germany, and Britain, and is testing in the United States. It is similar to the McHero sandwich, sold in parts of the United States. McDonald's sells french fries as its primary side order. Until 1967, McFries were never frozen, but were cut on-site from potatoes and immediately fried. In some international locations, they sell potato wedges, a type of French fry that is thick cut and wedge-shaped and fried onion pieces that are similar to onion rings. Many McDonald's locations in discount stores offer freshly popped popcorn and soft pretzels in addition to the normal menu. In PA stores, only soft pretzels are offered as a side option. Denali Mac – a burger that looks like the Big Mac, but it uses two quarter-pound beef patties. Sold only in Alaska, named after Denali (formerly Mount McKinley). McLobster – a lobster roll served in a hot dog bun with "lobster sauce" and shredded lettuce, introduced in 1993. The product had supply issues and was not very profitable nationally. Recently, it was only available in Atlantic Canada and New England region in the summer, when lobster is inexpensive. In the 2010s, McDonald's had short-term reintroductions in Canada and Italy. McCrab – in response to the McLobster, McDonald's along the eastern coast of the Delmarva Peninsula (comprising parts of Delaware, Maryland, and Virginia) developed the McCrab sandwich, a McDonald's version of the Chesapeake crabcake. Poutine – originally only to be found in French-Canadian communities, poutine is now found on the menu at most McDonald's' across Canada. Brownie Melt – similar to a Cinnamelt, it is a rich chocolate brownie with chocolate and white frosting. McRice – Most McDonald's restaurants in countries in Asia serve the product due to popular demand. It is normal rice. McSpaghetti – was launched in the late 1970s as a part of McD's dinner menu which included a number of Italian dishes. The dish is still available internationally such as in the Philippines where it is popular and is generally served with McNuggets. Angus Snack Wrap – wrap with Angus burger introduced to the U.S. market on August 9, 2010. Angus Snack wraps are available three ways: Deluxe (lettuce, tomato, onions, pickles, American cheese, mayo, mustard); Bacon & Cheese (onions, pickles, American cheese, ketchup, mustard, a strip of bacon); and Mushroom & Swiss (sauteed mushrooms, Swiss cheese, mayo). The Angus Wrap uses 1/2 of a regular Angus burger pattie. The McVeggie burger – a vegetarian burger on a whole wheat bun. Available in India, Slovenia, Greece, Malaysia, and Portugal. A special version is available in Cheung Chau branch in Hong Kong during the Cheung Chau Bun Festival. Veggie Clubhouse - first sandwich with a quinoa pattie. The McBean burger – a vegan burger where the patties are made with cannellini beans, kidney beans, onions, carrots and green peppers. Available in Sweden. Maharaja Mac – Chicken - like a Big Mac, but with two pressed spiced chicken patties instead of beef, served with a mustard sauce. Veg - A vegetarian version of the Big Mac sold at Mc Donalds India, containing patties made of potato, corn, peas, and cheese. Maharaja is a Hindi word meaning emperor. Paneer Salsa Wrap (paneer is an Indian unsalted white cheese). McAloo Tikki – breaded potato patty with onion and tomato on a plain bun (aloo is "potato"). Available at select stores in India, Greece, and Walt Disney World in Lake Buena Vista, FL. In India, since McDonald's does not serve beef or pork in any of its products, it has created a few vegetarian options to suit the 85% vegetarian populace. Thus, the cheeseburger is recast as a vegetarian option and served as an "Aaloo Tikki Burger" containing a potato patty and a slice of cheese. Georgie Pie — a meat pie sold in New Zealand and Australia. The brand was also the name of a New Zealand-based chain that was bought by McDonald's New Zealand in 1996 and was revived as part of the McDonald's menu in 2013 due to popular demand. Bacon Cheese Fries was added to the menu in January 2019. It adds melted cheddar cheese to go with bacon pieces. Veggie Crunch Burger - The vegetarian burger was launched in the Singapore market on September 6, 2016. Its patty is made with a mixture of up to seven types of vegetables, including green peas, carrots, tomatoes, capsicum, beans etc. However, its dressings contain garlic and eggs. The patty is fried in the same oil used for frying apple pies so it does not come in contact with meat products. The burger has received good reviews. In McDonald’s UK, EotF (Experience of the Future) restaurants offer the premium "Signature Collection", which consist of "The Spicy", "The Classic" and "The BBQ". These burgers are served on a brioche bun, and the patties are thicker, and take longer to cook. The collection costs more than the average Big Mac meal, respectively. McTh'lump — in the United States, popularised by the Adult Swim television series FishCenter Live, it is a secret menu item where a Filet-O-Fish is within a Big Mac. McDonald's introduced breakfast foods in 1972. McDonald's primary breakfast offerings are breakfast sandwiches. McMuffins are McDonald's signature breakfast sandwich. 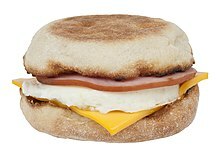 First sold at select restaurants in 1972 as the Egg McMuffin, five years before a breakfast menu officially went into effect, it consists of a fried egg, back bacon (called Canadian bacon in the U.S.) and American cheese on a toasted English muffin. Sausage or bacon McMuffins are also available. A Chicken McMuffin is offered in South Africa. McDonald's offers a line of breakfast sandwiches: bagels, biscuits, and a special type of maple flavored pancake called McGriddles. All can all be ordered with sausage, ham or bacon, with an optional choice of cheese and/or egg. Regional meat offerings include fried chicken, steak, spam and bacon. They are an internationally famous sandwich and as such have been well received. The McDonald's Hamdesal is a new breakfast sandwich which consists of a slice of ham on pandesal, which can be ordered plain, with eggs or with cheese. This sandwich is currently available in the Philippines. There are two styles of breakfast burritos available. The Sausage Burrito, introduced in 1991, is made with a flour tortilla, sausage, American cheese, eggs, onions, and peppers. The new McSkillet wrap burrito adds potatoes and salsa. Chicken and steak variants of the McSkillet exists in limited areas. Additional breakfast items include hotcakes; a platter known as a Big Breakfast comes with scrambled eggs, a hash brown, sausage or bacon, and a biscuit or English muffin. Biscuits and gravy are available in parts of the southern U.S.
Oatmeal was added to the breakfast menu on December 27, 2010, after it test-marketed well in Washington, D.C. and some parts of Maryland. In the test market areas, oatmeal started selling in late January 2010. A few American regional variations exist, in Hawaii and Guam McDonald's offers local breakfast items such as Spam, Portuguese sausage and fresh cut pineapple. And in New Mexico, there is a breakfast burrito on the menu, with both bacon and sausage varieties, called the Green Chile Sunrise Burrito. In the UK, McDonald's offers the standard McMuffin, Double McMuffin, bacon rolls, toasted bagels with jam or Philadelphia cream cheese, hash browns, Oatso Simple porridge, bagels with egg, cheese and bacon or sausage, and a range of wraps, that consist of sausage and egg, bacon and egg, or cheese and egg. Or the customer has the option to have the full wrap called the Breakfast Wrap which consists of sausage, bacon, egg, hash browns (potato rösti), cheese and an optional sauce, either ketchup or brown sauce. In 2018, McDonald’s UK removed the breakfast snack wraps and replaced them with the cheesy bacon flatbread. Since October 2015, McDonald's offers breakfast all day in Australia, Canada, Mexico (Tijuana, Baja California Norte only), New Zealand and the U.S. However, the full breakfast menu is not available at all hours. Only certain items, such as sausage burritos or hotcakes will be available beyond the usual 10:30 A.M. cutoff weekdays or 11:00 A.M. weekends. All U.S. restaurants expanded their all-day menu to add Biscuit sandwiches, Egg McMuffins & McGriddles in late September 2016. Since February 2016, breakfast bowls were added to the breakfast menu, available in some U.S. restaurants. Donut sticks were added in February 2019. Beverages purveyed by McDonald's varies regionally. McDonald's primary soft drink supplier is The Coca-Cola Company, except in restaurants which fall under an overall contract with PepsiCo such as the Staples Center and the University of Maryland, College Park Student Union. In the U.S. and Canada, Cadbury-Schweppes supplies Dr Pepper. S&D Coffee, Gavina and Kraft supply McDonald's Premium Roast Coffee for McDonald's U.S. restaurants except for the New England area, for which Green Mountain Coffee Roasters supplies Newman's Own branded coffee there. Hot and iced tea (supplied by S&D Coffee in the U.S.), hot chocolate, assorted juices and other regional beverages are available in various markets. The McCafe is an umbrella term for lattes, espresso, iced coffee, hot chocolate, mocha, malts, smoothies, and other drinks that are sold in several markets worldwide. Shakes are available in all U.S. McDonald's and many global markets Permanent flavors are vanilla, strawberry, and chocolate; regional or seasonal flavors include Caramel, Coffee, Cherry, Eggnog (during Christmas), Banana, Pumpkin (during Halloween), Strawberry Banana, Lime, Mango Raspberry, Honeycomb, Arctic Orange (sherbet), Orange Cream, Shamrock Shake (a green, spearmint Limited Time Offer shake for St. Patrick's Day), Chocolate Mint, and Rolo (available only in Canada and the UK. This flavoured milkshake was also available in the Republic of Ireland during the summer of 2007 for a limited time only). In June 1975, 13 months before the celebration of the United States Bicentennial, McDonald's introduced a blueberry-flavored shake in order to advertise "Red, White, and Blueberry Shakes" for independence day celebrations, which were available through August of that year. The run was repeated in summer 1976, but not since. In the U.S., starting in February 2010, "Triple Thick Shakes" were rebranded under the McCafe name, along with the addition of whipped cream, and a cherry on top, and a significant reduction in size. In Canada, McDonald's milkshakes are still sold under the "Triple Thick" name. Beer of different brands (varies locally) is available at McDonald's in Belgium, Czech Republic, France, Germany, Greece, Italy, Lithuania, Portugal, Romania, Slovenia, and Spain. Wine, Santa Julia of the Malbec varietal is available at McDonald's restaurants in the province of Mendoza, Argentina as part of a special menu called "Sabores Mendocinos" (Mendoza flavours). Irn-Bru is available in some Scottish McDonald's locations. Inca Kola is available in every Peruvian McDonald's location. McDonald's also offers 1% milk, 1% chocolate milk, and apple juice, most often as replacements for fountain drinks in Happy Meals. As of 2009[update], McDonald's Australia and New Zealand began offering Frozen Coke as part of their menu. It is available in small, medium or large sizes. Frozen Coke is a fixed menu item, with new flavors introduced multiple times a year, such as Frozen Fanta Sour Grape, Frozen Fanta Bubblegum and Frozen Sprite. Over summer, flavoured syrups have become available, for use with Frozen Sprite. In the 2013/2014 summer, Bubblegum, Pineapple, Wild Grape, Fairy Floss and Apple were available. Pies were introduced in 1968, and were exclusively deep-fried until 1992, when they were replaced by baked pies in most of the American market. The sole flavor available initially was apple, later supplemented, in certain periods and/or certain markets, by cherry, strawberry and creme, s'mores, sweet potato, and holiday flavors, among others. In Canada in the 1970s, blueberry was standard, as was a mixed-fruit pie called the Great Fruit Pie. Other regional varieties, both permanent and occasionally offered, include corn (Japan), cheese (Mexico, Guatemala, Panama, and Costa Rica), banana (Brazil and Hawaii), taro (Hawaii, Guam and Thailand), haupia (Hawaii), guava (Hawaii), mango (Indonesia), chocolate (Indonesia) and apricot (Russia). A soft serve ice cream product is available in several forms, including sundaes, cones (either vanilla or chocolate), and as the primary ingredient in the McFlurry. As with many other formulations of soft serve, cellulose gum is utilized as an extender and thickener. In Australia, the price of soft serve was 30 cents when it was introduced nearly 20 years ago. The McFlurry is a soft-serve ice cream dessert that has pieces of candy or cookies mixed into it. The McFlurry was first integrated into the menu at a Bathurst, New Brunswick, Canada franchisee in 1995 and in the U.S. in 1998. The flavors are crushed Oreo, M&M's Minis, Reese's, or Mars, Incorporated candy bars like Snickers, Twix, Galaxy, etc., Cadbury's candy bars like Twirl, Wispa, Creme Egg, Crunchie etc., Nestlé candy bars like Yorkie, Smarties, Drifter, Rolo, Butterfinger, etc. McDonald's also does limited time only flavors, e.g. for Shrek the Third it released the Ogre-Load flavor. In Australia, they had a special range for their 40 years in Australia celebration. The flavors were double choc fudge, bubblegum squash, strawberry crumble and caramel cookie. Also in Malaysia, a unique flavor called FuseofmyLife is offered to customers. The mixing blade for the dessert is actually a specially designed spoon with a hollow handle that attaches to the mixer spindle (except in Australia and New Zealand where the staff mix it by hand). The blade is used once then given to the customer to use as an eating utensil. Originally test marketed in Hawaii in 1997, it is now available in most of its markets. McDonaldland cookies are traditionally available and are similar to animal crackers, except the shapes of the cookies are of Ronald McDonald, Grimace, Birdie the Early Bird, and the Hamburglar, among other McDonaldland characters. In fact, they are manufactured by Keebler, and are just re-branded animal crackers (Elfin Crackers or Our Family Animal Crackers). In Australia, the McDonaldland Cookies are manufactured by Arnotts and are sold in McDonald's restaurants for $1. Freshly baked cookies manufactured by Nestlé are available in some markets. Among the cookies offered are sugar, oatmeal raisin, or chocolate chip. Cinnamon Melts – a popular cinnamon roll type item with cream cheese icing. Brownie melts – Similar to the Cinnamon melt, only chocolate flavored with fudge and cream cheese icing on top. Available only in selected markets. The Fruit and Yogurt Parfait – a mix of frozen strawberries and blueberries and vanilla yogurt, sold with a package of granola topping. Smoothies are available in some locations in either Blueberry Pomegranate, Strawberry Banana, or Mango-Pineapple flavors. In the test market areas, smoothies were introduced in 2009. In 2012, McDonald's Australia and New Zealand began offering a 'McFloat'. It contained Frozen Coke and/or the promotional frozen beverage, a small amount of soft serve and a lot of ice. In Australia, the Frozen Coke 'McSpider' has also been purveyed, which consists of frozen Coke and soft serve ice cream. Angus burgers – Four types: the Angus Deluxe (American cheese, sliced red onions and sliced red tomatoes, iceberg lettuce, pickles, mustard, and mayonnaise); Angus Mushroom and Swiss (sautéed mushrooms, Swiss cheese and mayonnaise); Angus Bacon and Cheese (bacon, American cheese, sliced red onions, mustard, ketchup and pickles); and the Angus Chipotle BBQ Bacon (chipotle sauce, red onions, pickles, bacon, and American cheese). In Australia and New Zealand, there are three Angus burgers sold; The Grand Angus (which is a clone of the Angus Deluxe) and the Mighty Angus (which resembles the Angus Cheese and Bacon, but with no pickles and mayonnaise and onion relish replacing the ketchup and mustard). For a limited time only, the Angus The Third, similar to the Grand Angus, but with no mustard and made with a tomato chili relish and only one slice of cheese. Also, for a limited time, Angus the Great was sold, a clone of the Angus Mushroom and Swiss. In October 2012, an Angus version of the Cheddar Bacon Onion (CBO) Sandwich was made available, consisting of a horseradish-like sauce, grilled caramelized onions, bacon and cheddar cheese. In May 2013, McDonald's stopped selling the Angus burger. Two years later the third-pound burgers returned (known as Sirloin Third Pound Burgers), but as a limited-time promotion. It came in three sandwiches: Bacon and Cheese, Lettuce and Tomato, and Steakhouse. The Angus Burgers are still available in Canada and some markets in Latin America. Arch Deluxe – An attempt to produce a "luxury" hamburger, promoted by a high-profile advertising campaign (introduced in 1996), today considered one of the most expensive failures in McDonald's history. It featured a honey mustard-type sauce, quarter-pound beef patty on a potato roll, with leaf lettuce, tomato, red onion, and cheese; peppered bacon was also offered for an extra charge. The Arch Deluxe was accompanied with three other burgers at the time, the Crispy Chicken Deluxe (later renamed the Crispy Chicken Sandwich), the Grilled Chicken Deluxe (later renamed the Chicken McGrill), and the Fish Filet Deluxe (since discontinued along with the Arch Deluxe itself). Barry Burger – A double bacon cheeseburger with onions and barbecue sauce named after football player Barry Sanders, sold mainly in his home state of Kansas. BBQ Chicken – A toasted bun featuring shredded chicken and zesty BBQ sauce. Beef Wennington – A burger offered solely in the Chicago area in 1998–99, named after former Chicago Bulls player Bill Wennington. It featured a single patty topped with cheese, onions, barbecue sauce and a slice of Canadian bacon. Chopped Beefsteak Sandwich – test-marketed in various markets across the United States in 1980 as part of a McDonald's "Dinner Menu", offered only after 4:00 p.m. The Chopped Beefsteak Sandwich was essentially an elongated hamburger of a different quality served on a short French roll, similar to a sub or hero roll. Packets of steak sauce (A1 sauce in Chicago) were available for the sandwich. Big 33 or McJordan Special – A quarter-pound burger with bacon and special barbecue sauce named after basketball players Larry Bird and Michael Jordan, respectively. Boselli Burger – Jacksonville, Florida, franchises also featured the Triple-Double Burger in 1998, named after Jacksonville Jaguars tackle Tony Boselli. Bratwurst – For a few years during the 1990s and in 2002, Johnsonville brand bratwurst on a hot dog-like roll was sold in some U.S. markets for a limited time each fall. A few locations in Eastern Wisconsin, which is the major market for the Sheboygan County-based company still offer bratwursts on a seasonal basis. Buffalo Ranch McChicken (also the Hot 'n Spicy). Catfish Sandwich – A sandwich made with a catfish patty, lettuce, and tangy sauce and sold on a McRib-style bun. Sold at McDonald's locations in Kentucky, Tennessee, Alabama, Arkansas, and Mississippi for a brief period in March 1991. Cheddar Melt – a quarter pound beef patty smothered with grilled onions (sauteed in butter and teriyaki), then topped with cheddar cheese sauce on a light rye bun, offered in 1988, the 1990s, 2004, and 2007. They are still available in Brazil under the name Cheddar McMelt. Chicken Fajitas – The Chicken Fajitas consisted of a small soft tortilla, a grilled vegetable medley, and grilled chicken. The fajita was in the traditional thin wrapping paper. These are still available in British Columbia, Saskatchewan, Nova Scotia, Newfoundland (at certain locations), Alberta (at select locations in the Edmonton area) and at all non-Walmart McDonald's in Ontario. Chicken McBites – popcorn chicken breast with "home-style seasoning" offered through April 20, 2012, in 3 oz (85 g), 5 oz (140 g) and 10 oz (280 g) versions. Dipping sauces include Ranch, Sweet n' Sour, Tangy BBQ, Chipotle BBQ, Honey Mustard, Spicy Buffalo, and Sweet Chili. Chicken Parmesan Sandwich – A chicken breast covered in bread crumbs and topped with tomato sauce and mozzarella on a toasted bun. Chicken Platter – A grilled chicken burger served with lettuce and tomato on the HotCakes tray. Chicken Selects – McDonald's version of chicken strips. They were introduced in early 1998 and offered again as a permanent part of the menu in late October 2003. They are sold in 3-, 5-, or 10-piece sizes and include choices of spicy buffalo, creamy ranch, honey mustard, and chipotle barbecue dipping sauces; sauce selections in the UK are smokey barbecue, sour cream and sweet chili sauce. Sold in the United States, Canada, Israel and the UK. Available in Australia under the name Chicken McDippers. McDonald's stopped selling Chicken Selects in the United States in February 2013, but they returned to the menu on 25 February 2015, for a limited engagement and were renamed Chicken Select Tenders. Since September 2017, they were reinstated and known as Buttermilk Crispy Tenders. Chicken Selects are still sold at McDonald's restaurants in the United Kingdom and Ireland. Corn Dog McNuggets – For a brief time in 1991, McDonald's locations in Richmond, Virginia offered a multi-pack of mini corn dogs without sticks. They were offered again in 2002 as the "Mini Corn Dogs". Cuban Sandwich – Roast pork and ham sandwich on a long roll with Swiss cheese, mustard, and pickles. One of several Hispanic-inspired menu items briefly sold at South Florida units in 2001. Derby Burger – A single patty hamburger with American Cheese, lettuce, tomato, ketchup, mayonnaise, and bacon. It was a regional item sold in the mid-1990s in Louisville, Kentucky only during the spring to coincide with the Kentucky Derby. Discontinued in the early 2000s (decade). Diet Coke Float and Coke Float – In 1991 McDonald's ran a limited time promotion selling a float made with Diet Coke or Coke with low-fat soft-serve frozen yogurt in a collectable Coke bell glass. It sold for $1.59 with 40 cents from every sale donated to Ronald McDonald Children's Charities. Dinner Menu – After testing pasta in the South in 1989, McDonald's began testing a pasta-based menu at 40 units across Rochester, New York, in September 1991, including lasagna, fettuccine alfredo, and spaghetti with meatballs. In the early 1990s, a new Dinner Menu was tested for 6–12 months at two locations in New York and Tennessee. It consisted of the pizza mentioned below but also included lasagna, spaghetti, fettuccine alfredo, and roasted chicken as entrees. The side dishes included mashed potatoes with gravy and a vegetable medley. For the dessert, it included a brownie à la mode or peanut butter pie. Eggs Benedict McMuffin – Canadian style bacon, egg, special breakfast sauce, and American cheese on a toasted English muffin. Fried Roast Beef Sandwich – In 1968 this product was launched targeting adults. Sold with a package of McDonald's BBQ sauce on the side using the slogan "McDonald's is my kind of place"; it was inspired by a franchisee's version of an Arby's sandwich. The sandwich failed due to the costs of getting roast beef slicers; no matter how many sandwiches they could sell, it would never turn a profit. Grilled Cheese Happy Meal – There was a Happy Meal introduced during the early part of the 2000s (decade) that contained a grilled cheese sandwich. It was discontinued the same summer it was released but is still sold in some Canadian markets. Grilled Chicken Flatbread Sandwich – Grilled chicken strips, lettuce, tomato, grilled onions, pepper jack cheese, and a creamy herb sauce served wrapped in a heated flatbread. Served briefly in June 2002, and again from December 27, 2002, until February 9, 2003. Happy Meal Breakfast – The Happy Meal Breakfast was a meal that was smaller than the traditional breakfast that lasted from the 1980s to 2009. It was discontinued by the advice of the Nutrition department at the Corporate Headquarters in Oak Brook, Illinois, but is still sold in Hong Kong. Hockey Hero burger, sold only in Canada. Jason Kidd Burger – Downtown Phoenix, Arizona, franchises had a Limited Time Offer burger named after NBA player Jason Kidd, while he played for the Phoenix Suns. McSpin - An ice cream that is similar to McFlurry but mixed faster and with threed toppings inside. It is seen in 1996–2005. Hot dogs – In 1937, hot dogs were the first things sold in McDonald's. Then in CEO Ray Kroc's 1977 autobiography, he prohibited the company from selling them[clarification needed], regardless of potential demand, as he regarded them as unhygienic; however, hot dogs were reintroduced in 1995 at some Midwestern located stores (at the option of the franchise-holder) as a summer item. UK stores sold hot dogs during 2002 on the McChoice menu (later PoundSaver) and as a seasonal menu item in the summer of 1999. Also, at least one American restaurant offered Oscar Mayer hot dogs at some time, notably in Bethel Park, Pennsylvania, and McDonald's locations at Toronto Metro Zoo and SkyDome in Toronto offered hot dogs until 1999. Starting in the year 2007, a few McDonald's began selling Hot Dogs in central Pennsylvania due to popular demand from local sports fans. They can be found at 12 locations as of 2011[update]. In Tokyo locations, hot dogs were available from 1990 until 2004, and were reintroduced for 2009, dubbed the "McHot Dog". McDonald's locations in Chile also sold hot dogs for a brief period in 2004. Hot Ham 'N Cheese – Sliced ham, American cheese, lettuce and tomato on a triple split, sesame seed bun with a choice of mayonnaise or honey mustard sauce. Hulaburger – A Ray Kroc invention, it featured a slice of pineapple instead of meat. Originally intended for Roman Catholics who are not allowed to eat meat on Fridays during Lent. It was test-marketed in 1963 alongside the Filet-O-Fish sandwich, with the highest seller being added to the menu full-time (the Filet-O-Fish, a creation of an Ohio franchiser, won). Italian Doubles – A limited summer promotion in Canada in 1989. Two regular patties on a hamburger bun with one slice of mozzarella cheese and marinara sauce. Kiwiburger – In the 1990s, New Zealand sold a burger reflecting their national icon the Kiwi. It was a single beef patty hamburger, with egg (identical to the egg in McMuffins), cheese, lettuce, tomato, beetroot, onions, ketchup ("tomato sauce") and American mustard. It came in distinctive packaging with 46 classic Kiwi quotes, Kiwiana, and Kiwi sporting icons, which were also used in promotions of the burger. Complications with the cooking of the egg and the use of certain ingredients, that no other McDonald's burger had, saw the Kiwiburger discontinued. It has since returned occasionally to the menu for limited times. McChicken LT (McDonald's Chicken Lettuce and Tomato) was the chicken version of the McDLT featuring the same two-sided container as the McDLT except the packaging was yellow instead of white. It was introduced about the same time as the McDLT in the mid-1980s. The chicken was a grilled, unbreaded chicken breast placed on the heel of the bun in one of the compartments. The toppings were shredded lettuce, tomato and mayonnaise assembled on the top half of the bun in the other compartment. Cheese was an optional addition for an extra US$0.10. The grilled chicken breast was then basted with a brushing of melted butter. As with the McDLT, the consumer would finalize preparation of the sandwich by combining the hot and cool sides just prior to eating. The McChicken LT was discontinued in the Fall of 1987. McDLT – The McDLT (McDonald's Lettuce and Tomato) was sold in a novel form of packaging. The McDLT was introduced in the fall of 1984 as the Lettuce and Tomato Special. The meat and bottom half of the bun were prepared separately from the lettuce, tomato, American cheese, pickles, sauces, and top half of the bun. Both were then packaged into a specially designed two-sided styrofoam container. The consumer was then expected to finalize preparation of the sandwich by combining the hot and cool sides just prior to eating. It was discontinued between December 1990 and January 1991 due to environmental concerns with styrofoam. McDonald's Own Chocolaty Chip Cookie - mini-chocolate chip cookies which came in a small rectangular box. McChicken with tomato - added in some time in the 1980s. McDonaldland Cookies - cookies shaped like the McDonald's characters. originally came in a white box with a handle and later smaller rectangular boxes with cartoon images. McDouble Cruncher – two patties with a slice of cheese, chipotle BBQ sauce and crispy onions. McGrilled Chicken Classic – A sandwich featuring a grilled chicken breast portion that was introduced in September 1993 and was produced before being replaced by the Grilled Chicken Deluxe/Chicken McGrill. McLean Deluxe – A lower-calorie Quarter Pounder-type sandwich (introduced in 1991) containing 90% lean beef and 10% water with carrageenan, a seaweed extract, to hold the water and beef together. This item was otherwise identical to the Big N' Tasty and the McDLT. McRye – a hamburger on rye bread sold in Finland in late 1990s. McSoup – Campbell's Soup sold at McDonald's available in Broccoli & Cheese and Chicken Noodle. (This product is only sold in winter months in select markets). McStuffin – a pocket sandwich available with various fillings. McStuffins were sold for a short time in 1993 and were discontinued that same year because of their lack of popularity. McWraps – Inspired in the Mexican burritos Chicken Caesar, Chicken and Garden Salad wraps served toasted in a thick herb flatbread. McWraps is still offered in some parts of Europe (for instance in Denmark and Croatia). Michael Dean Perry burger, for the then Cleveland Browns star. Mighty Wings – deep-fried spicy chicken wings. McDonald's began selling these in 1990 as an optional item and stopped selling them in 2003. They are still sold in China, Spain, Samoa, and the U.S. Virgin Island of St Croix as of March 6, 2010. Also sold as McWings in Pakistan, they were discontinued for a while but relaunched. On September 9, 2013, McDonald's brought the Mighty Wings back to its menus in all of its American restaurants as a limited time offer available until November 2013. The Mighty Wings did not sell well its second time around in the U.S. The main problems cited with the Mighty Wings was the price point versus the amount purchased. Compared with competitors, the pricing was determined to be too high, but McDonald's stated that due to overruns in purchasing, the company could not sell them at lower prices without losing money. On February 24, 2014, McDonald's decided to put them back on the menu for a limited engagement to liquidate the remaining inventory at a lower price in all U.S. locations. Mozzarella sticks - 3 fried cheese sticks with marinara sauce on the side. Was on the Dollar Menu & More menu from December 2015 to March 2016. Super Size was McDonald's restaurants' largest size on their french fries and soft drinks. The documentary film Super Size Me had a negative effect on the image and popularity of the Super Size fries and drinks offering. In the United States, McDonald's began to phase out the supersized option from their regular menu in March 2004. The company stated the need to simplify their menu and to offer healthier food choices. Onion Nuggets – introduced at the same time as the Beefsteak Sandwich as the side item for the Dinner Menu. Onion Nuggets were chopped onions shaped into small solid pieces, dipped in batter and deep-fried. Philly Cheesesteak – Slices of steak and Swiss cheese with onions. Served until August 2007 at Australian and American McDonald's. This sandwich is still available in Canada, made with cheese spread and green bell pepper. Pizza / Mcpizza – McDonald's has also attempted pizza at various times, with an apple-pie–like McPizza and more conventional McDonald's Pizza. A line of personal-sized pizzas was first seen in the late 1970s in test-market stores near interstate highways around Milwaukee and Madison. In Canada (c. 1992–99), the pizza originally began as a family-sized pizza that was brought out to the table by an employee and placed on a raised rack in the centre of the table. Later it was scaled down to a personal-sized pizza. However, variations have found their way into some international markets such as India (the pie-like "Pizza McPuff"). McDonald's also test marketed a 14-inch, round, traditional-style pizza in Evansville, Indiana, and nearby Owensboro, Kentucky, in 1989. By 1991, the McDonald's test markets for pizza had grown to over 500 McDonald's locations before the pizza test was placed on hold. Pizza was discontinued in most restaurants by 2000. The reason for eliminating pizza from the menu was that it took 11 minutes to cook a pizza, and McDonald's wanted to keep its reputation for fast service. As of March 2017, two McDonald's locations, one in Pomeroy, Ohio, and the other in Spencer, West Virginia still offer the family style McPizza. Roast Beef on a Roll – A roast beef sandwich made just like the Arby's roast beef sandwich. Sold in 1968. Root Beer Float – A combination of vanilla soft-serve ice cream and root beer. Rory Sparrow burger was sold in the Sacramento area. It was named after the Sacramento Kings star. Salad Shakers – A salad of lettuce, croutons and other vegetables in a tall dome-shaped plastic container. Salad Shakers were introduced in the spring of 2000 and are still available in the Netherlands. Son of Mac – Also known as the Mini Mac or Baby Mac, a version with only one patty and no centre roll piece. It sold as a Baby Mac in New Zealand, was sold in Australia, and is now discontinued. 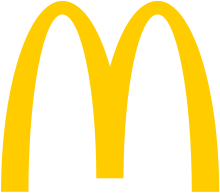 Served by some stores in the United States under the moniker "Mac Jr". It's still sold in places in Canada, known as the "kid's mac"
McSpicy Burger – Once released, it was cancelled for short time until it resurfaced and is now served in Philippine markets only. Southern Fried-Chicken – Was sold in Australia up until mid-1986. This was available as a two-piece (or three-piece) pack including French Fries. This was replaced by the current McNugget range, as the nuggets became cheaper to produce and safer to cook. Spanish Omelet Bagel – existed during the mid-to-late 2000s. Now discontinued. Strawberry Shortcake McFlurry – Vanilla soft-serve ice cream with strawberry topping and Vanilla Cookie pieces mixed together. Superhero Burger – Featuring 3 patties, yellow American cheese, white American cheese, tomato, lettuce, onion, and mayo all laid out on an elongated bun like a hero sandwich. The burger was released as part of the "Taste of the Month" series that McDonald's ran in 1995 where they had a new burger every month. The Superhero Burger was also tied into the promo campaign for the film Batman Forever and the ads for it featured Batman and the Batmobile. Toasted ravioli - Sold in St. Louis from 1991 to 1995. Introduced with a commercial featuring the St. Louis arch sprouting a second arch. Torta – In 2000, the company released their own version of tortas, a Mexican sandwich, in Southern California on a trial basis. Triple Ripple – A mixed cone with strawberry, vanilla, and chocolate, topped with a plastic top. Upside Down Iced Tea – A new cup tested at select locations in the southeast United States in the late 1990s. It featured an ice compartment at top of the cup to keep the beverage cold. It was quickly discontinued. Szechuan Sauce or Mulan Sauce, a dipping sauce for chicken nuggets, was created to promote the 1998 Disney film, Mulan. The sauce was sold for a limited time, starting on June 16, 1998. Szechuan Sauce returned to the cultural spotlight almost twenty years later after being referenced numerous times in "The Rickshank Rickdemption", the Season 3 premiere of the Adult Swim animated comedy Rick and Morty. The sauce was announced to return to all McDonald's stores on February 26, 2018 due to popular demand. An Apple Cinnamon Sauce was released to promote the 1998 Pixar film, A Bug's Life. ^ Klein, Chridtopher (May 15, 2015). "McDonald's Surprising Start, 75 Years Ago". HISTORY. Archived from the original on January 19, 2018. Retrieved January 18, 2018. ^ Grimminck, Robert (February 22, 2017). "10 McDonald's Menu Items We Wish They'd Bring Back". Toptenz.net. Retrieved January 18, 2018. ^ "Does McDonald's have too many items on the menu?". www.marketplace.org. Retrieved February 23, 2019. ^ a b Buiso, Gary (December 2, 2012). "More burning questions about NYC answered". New York Post. Archived from the original on July 28, 2017. Retrieved July 13, 2017. ^ "McDonald's Menu: Our Full McDonald's Food Menu". McDonald's. Archived from the original on July 19, 2017. Retrieved July 13, 2017. ^ "The Big Mac turns 40, gets a museum". ABC News. August 26, 2007. Archived from the original on January 19, 2018. Retrieved January 18, 2018. ^ "Big Mac®: 100% Beef Burger with Special Sauce". McDonald's. Archived from the original on January 19, 2018. Retrieved January 18, 2018. ^ Artz, Matthew (December 31, 2009). "Fremont's 'hamburger king' dead at 81". Oakland Tribune. Archived from the original on January 28, 2010. Retrieved January 12, 2010. ^ "ACCUEIL". McDonald's France. Archived from the original on January 19, 2014. ^ . "The Best of the West meets the Best of the East — The Mighty Duel — Montreal Steak Spice BBQ Angus". McDonald's. ^ Sterrett, David (June 20, 2010). "McDonald's Drops Big 'N' Tasty, Adds Oatmeal". AdAge. Archived from the original on January 19, 2018. Retrieved January 18, 2018. ^ AP Newswire (July 2, 1997). "McDonald's hoping new burger a Whopper stopper". The Augusta Chronicle. Archived from the original on October 30, 2007. Retrieved October 23, 2007. ^ a b c d Wong, Venessa (March 12, 2014). "After Year of Flubs, McDonald's Loses Its Taste for Novelty". Bloomberg Business. Archived from the original on March 30, 2015. Retrieved March 3, 2015. ^ "Product Nutrition". McDonald's. Archived from the original on May 6, 2016. Retrieved July 13, 2017. ^ "McDonald's 1955 Burger Review". Burger Lad. October 16, 2013. Archived from the original on June 29, 2017. Retrieved July 13, 2017. ^ Reynolds, John (August 25, 2011). "McDonald's cooks up 'no-nonsense' 1955 burger for the UK". Marketingmagazine.co.uk. Archived from the original on March 4, 2016. Retrieved July 13, 2017. ^ "You can now 'Zhng' McDonald's McSpicy Burger with extra Cheese or Egg". greatdeals.com. Archived from the original on October 29, 2016. Retrieved March 24, 2018. ^ "Jalapeño Double". McDonald's. Archived from the original on January 20, 2018. Retrieved January 19, 2018. ^ Little, Katie (November 24, 2015). "McDonald's breakfast burger mashup debuts". CNBC. NBC News. Archived from the original on November 25, 2015. Retrieved November 25, 2015. ^ a b "Artisan Grilled Chicken". McDonald's. April 6, 2015. Archived from the original on August 8, 2017. Retrieved July 13, 2017. ^ "North County News - San Diego Union Tribune". Nctimes.com. Archived from the original on September 29, 2007. Retrieved July 13, 2017. ^ "McDonald's Reveals Its New Chicken Menu" (PDF) (Press release). McDonald’s Australia. November 13, 2007. Retrieved June 24, 2018. ^ "Promotions". MacPride.Net. Kaufman Enterprises. 2005. Archived from the original on May 10, 2009. Retrieved July 13, 2017. ^ "Chicken Maharaja Mac". McDonald's India. Archived from the original on March 27, 2017. Retrieved March 13, 2017. ^ "McDonald's Taking Bite out of Chicken Market". BurgerBusiness. October 24, 2011. Archived from the original on March 1, 2018. Retrieved February 28, 2018. ^ "The 5 McDonald's Items We Miss Most". ABC News. April 15, 2015. Archived from the original on March 1, 2018. Retrieved February 28, 2018. ^ a b "Tasty Basket 30 pezzi" (in Italian). McDonald's Italia. December 3, 2012. Retrieved July 13, 2017. ^ "McDonald's Buttermilk Crispy Tenders Are Back". December 29, 2017. Archived from the original on March 1, 2018. Retrieved February 28, 2018. ^ Clark, Paul (February 20, 2007). "No fish story: Sandwich saved his McDonald's". USA Today. Archived from the original on May 2, 2009. Retrieved April 17, 2009. ^ "Fish McBites fail to spark McDonald's sales". Associated Press. March 8, 2013. Archived from the original on October 13, 2017. Retrieved October 13, 2017. ^ Eisenberg, Daniel (September 25, 2002). "Can McDonald's Shape Up?". Time. Archived from the original on June 11, 2010. ^ "McDonald's Dipping Sauces & Salad Dressings". McDonald's. Archived from the original on February 25, 2018. Retrieved March 14, 2018. ^ "History of McDonald's". McDonald's. Archived from the original on August 19, 2017. Retrieved August 28, 2017. ^ Velasco, Schuyler (August 21, 2013). "10 fast foods that have disappeared: McLobster". Christian Science Monitor. Archived from the original on March 10, 2014. Retrieved March 11, 2014. ^ Ross, Spencer (January 6, 2004). "A connoisseur's guide to downtown poutine - a & e". The McGill Tribune. Wayback Machine. Archived from the original on February 20, 2009. Retrieved January 13, 2017. ^ a b c Velasco, Schuyler (August 21, 2013). "10 fast foods that have disappeared: 4. McSpaghetti". Christian Science Monitor. Archived from the original on March 12, 2014. Retrieved March 11, 2014. ^ "Forays of a Finance Foodie: McDonald's Steps Up Their Style: New Product Preview Day! [New York]". Financefoodie.com. June 8, 2010. Archived from the original on April 11, 2016. Retrieved July 13, 2017. ^ "Maharaja Mac - Veg and Chicken options". McDonald's India. Archived from the original on March 13, 2017. Retrieved March 13, 2017. ^ Harding, Luke (December 28, 2000). "Give me a Big Mac - but hold the beef". The Guardian. Archived from the original on March 13, 2017. Retrieved March 13, 2017. ^ Waxman, Olivia B. (May 3, 2016). "McDonald's Is Testing Garlic Fries". Time. Archived from the original on February 13, 2017. Retrieved July 13, 2017. ^ Adult Swim staff (February 9, 2018). "Friday, February 9th, 2018 - Fishcenter Live - Adult Swim". Adult Swim. Turner Broadcasting System, Inc. Retrieved February 16, 2018. ^ Adult Swim staff (February 15, 2018). "Thursday, February 15th, 2018 - Fishcenter Live - Adult Swim". Adult Swim. Turner Broadcasting System, Inc. Archived from the original on February 17, 2018. Retrieved February 16, 2018. ^ Google Drive staff (February 7, 2018). "mc'th'lump RECAP.wmv". Google Drive. Google LLC. Retrieved February 16, 2018. ^ "Ourfood". McDonald's Philippines. Archived from the original on June 6, 2017. Retrieved July 13, 2017. ^ Saltz, Joanna (February 21, 2016). "McDonalds Gets Rid Of One Key Breakfast Menu Item—And People Are Pissed". Delish. Archived from the original on December 8, 2017. Retrieved December 21, 2017. ^ "McDonald's: You Deserve A Hash Brown All Day". NPR.org. September 2, 2015. Archived from the original on March 1, 2016. Retrieved March 7, 2016. ^ Snopes (March 7, 2016). "McDonald's Shakes : snopes.com". snopes. Retrieved March 7, 2016. ^ "Triple Thick Milkshake®". McDonalds.ca. Archived from the original on July 9, 2017. Retrieved July 13, 2017. ^ "McDonald's and Santa Julia present their classic proposition for the Harvest". Santa Julia. January 14, 2017. Archived from the original on December 5, 2017. Retrieved December 4, 2017. ^ Lovelace Jr., Berkeley (July 22, 2016). "McDonald's tests out new baked apple pie in North Carolina, California". CNBC. NBC News. Archived from the original on March 23, 2018. Retrieved March 22, 2018. ^ Lam, Charles (April 6, 2015). "Is McDonald's Bringing Back Its Fried Apple Pies?". OC Weekly. Archived from the original on March 23, 2018. Retrieved March 22, 2018. ^ "McDonald's USA – USA Core Menu Items by Ingredients". McDonald's Corporation. Archived from the original on April 26, 2009. Retrieved May 29, 2009. ^ "McDonald's Nutrition Calculator" (PDF). McDonald's. Archived (PDF) from the original on July 8, 2016. Retrieved July 13, 2017. ^ "Why don't you mix the mcflurry anymore like you used to?". December 10, 2013. Archived from the original on July 14, 2014. Retrieved June 21, 2014. ^ "A McFlurry of tasty ideas". Honolulu Star-Bulletin. August 13, 1998. Archived from the original on December 3, 2013. Retrieved June 12, 2012. ^ "Steve McFlurry USPTO trademark information". United States Patent and Trademark Office. December 19, 1997. Retrieved September 1, 2006. ^ "Large Frozen McSpider Coke". McDonald's AU. Archived from the original on July 9, 2017. Retrieved July 13, 2017. ^ "McShakeup". The Huffington Post. March 1, 2013. Archived from the original on March 4, 2013. ^ Choi, Candice. "McDonald's cuts Angus burgers from menu". Usatoday.com. Archived from the original on September 22, 2017. Retrieved July 13, 2017. ^ "R.I.P. McDonald's Angus Third Pounder". The Huffington Post. May 9, 2013. Archived from the original on October 26, 2013. Retrieved October 18, 2013. ^ McGrath, Jane. "5. The Hula Burger - 5 Failed McDonald's Menu Items". HowStuffWorks. Archived from the original on May 12, 2017. Retrieved July 13, 2017. ^ Elliott Harris. "Beefing up his role – Bulls' Wennington latest burger celebrity". Chicago Sun-Times. March 8, 1998. Sports, 14. ^ Times, The (August 6, 1998). "Jaguars: Advertising war games have definitely begun 08/16/98". Jacksonville.com. Archived from the original on May 20, 2017. Retrieved July 13, 2017. ^ "McDonald's testing catfish". The Press-Courier. February 14, 1991. Retrieved July 13, 2017. ^ "McD brings back Cheddar Melt". Nation's Restaurant News | Find Articles at BNET. Wayback Machine. Archived from the original on April 26, 2009. Retrieved July 13, 2017. ^ "McDonald's Unveils Chicken McBites". Los Angeles Times. January 25, 2012. Archived from the original on September 5, 2012. ^ "McDonald's USA - USA Core Menu Items by Ingredients". Web.archive.org. Archived from the original on May 13, 2008. Retrieved July 13, 2017. ^ "McDonald's chicken snack a hit". Azcentral.com. January 30, 2007. Retrieved July 13, 2017. ^ "Bid Adieu To Chicken Selects As McDonald's Makes Room On The Menu For Newer Items". Consumerist. February 28, 2013. Archived from the original on October 14, 2017. Retrieved July 13, 2017. ^ Baertlein, Lisa (March 1, 2013). "McDonald's dropping Fruit & Walnut Salad, Chicken Selects in U.S." Reuters. Archived from the original on November 16, 2015. Retrieved October 13, 2017. ^ "Mcdonald's Tries Adding Hispanic Fare To Fast Food - tribunedigital-orlandosentinel". Orlando Sentinel. October 28, 2001. Archived from the original on October 18, 2017. Retrieved July 13, 2017. ^ "Floats offered at McDonald's". Beaver County Times. May 22, 1991. p. 14. Retrieved July 12, 2017. ^ a b McGrath, Jane. "5. The Hula Burger - 5 Failed McDonald's Menu Items". HowStuffWorks. Archived from the original on May 12, 2017. Retrieved July 13, 2017. ^ a b Love, John F. (1995). McDonald's: Behind the Arches (Revised ed.). New York: Bantam Books. ISBN 0553347594. ^ "McDonald's Kiwi Burger television advertisement – New Zealand Film Archive". Archived from the original on July 14, 2011. Retrieved October 15, 2010. ^ "US4653685 (A)". Espacenet. Retrieved October 13, 2017. ^ Chaudhry, Rajan (July 31, 1989). "McPizza? McDonald's widens pizza test: pizza operators gird for assault". Nation's Restaurant News. Findarticles.com. Archived from the original on February 13, 2016. Retrieved November 13, 2009. ^ Prewitt, Milford (October 7, 1991). "McDonald's developing separate dinner menu, puts pizza test on hold". Nation's Restaurant News. Findarticles.com. Archived from the original on May 1, 2009. Retrieved February 28, 2009. ^ Pemberton, Becky (March 10, 2016). "Ohio and West Virginia McDonald's are still selling MCPIZZA". Daily Mail Online. Archived from the original on February 16, 2017. Retrieved July 13, 2017. ^ Kim, Jae-Ha (June 21, 1998). "Beyond Asian stereotypes". Chicago Sun-Times: 18. Archived from the original on June 22, 2017. Retrieved October 16, 2017. ^ Gibson, Richard; Orwall, Bruce (March 5, 1998). "New Mission for Mickey Mouse, Mickey D". The Wall Street Journal: B1. For 'Mulan,' the chain is contemplating serving plum or Szechwan sauce with its Chicken McNuggets. ^ Har, Janie (June 19, 1998). "Movie tie-in holds nugget of debate". Scripps Howard News Service. Both the Chicken McNuggets, offered with a "Szechwan" dipping sauce, and "Mulan" Happy Meals debuted Tuesday. ^ Alexander, Julia. "Rick and Morty fans are bidding more than $4,500 on Szechuan sauce (update)". Polygon. 14 August 2017. Archived from the original on October 3, 2017. Retrieved October 6, 2017. ^ Smith, Aaron (October 9, 2017). "McDonald's vows to reboot Szechuan Sauce for spurned 'Rick and Morty' fans". CNN Money. Archived from the original on December 15, 2017. Retrieved December 15, 2017. "McPizza! – Tasting the elusive McDonald's Pizza". Science Tortilla (YouTube). March 14, 2015. – Video on a taste test of a McPizza from one of the two locations still selling it. McGrath, Jane. "5 Failed McDonald's Menu Items". HowStuffWorks, Inc. Retrieved March 11, 2014. This page was last edited on 20 April 2019, at 03:10 (UTC).